No tourist location is complete without a cuisine unique to its culture and tradition. And Bali doesn’t disappoint in that field. While the variety might not be more than 20 or so items, they sure cover up for that in the flavour. Bali is a meat lover’s paradise, with sumptuous sea food, at cheap prices. A must have for the food in Bali is in a place called Jimbaran, which is by the beach. The people of Bali love their sea food, and love it when outsiders indulge in the same. Presentation has always been awesome, be it a post 5 start hotel, or a small shack by the beach. And a cool Bintang beer to accompany, and your set for the night! Bintang is the local beer that one can find in any shop. 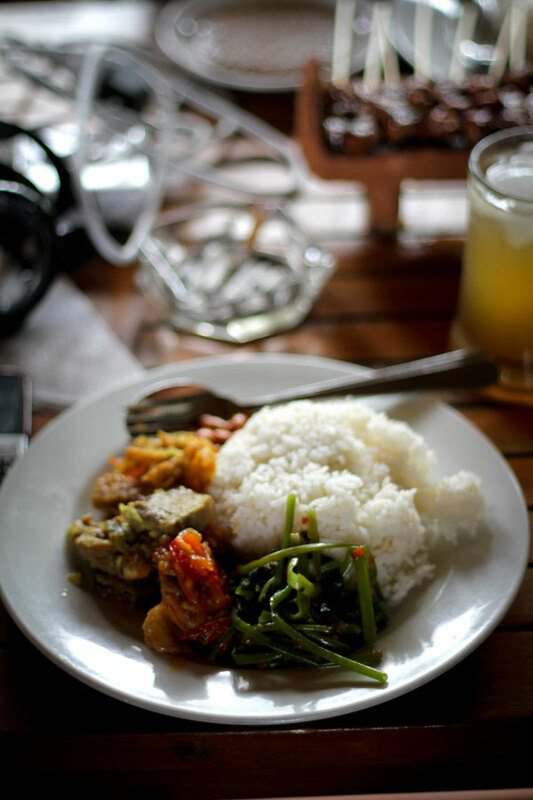 The food in Bali can tend to get a little dry for the average foodie. They eat their rice without any gravy, and provide only a couple of spicy sauces. Asking for soup based dishes helps in such situations helps. Photographer tip – Food photography always requires a lot of light. And since its mostly indoors, a flash is almost a necessity. I was without my flash on this occasion, the ambient light just about was enough. Food photography also loves whites. White plates, napkins, cutlery always add to the photo. And the more the colourful the food, the better. Overexposure on white food should always be tackled before it ruins the images.